There is no city in the world which has more green space woven through it then London, rough flowered parks, manicured squares and countless hidden back gardens, roof terraces and potted balconies. At the first hint of sunshine Londoners love nothing more then to set out a rug or a table and chairs in the open, cold beers or a bottle of wine.. and something extra specially summery to eat. This week we have been skiving out of the office a little earlier then normal to our local- Primrose hill, with rugs, Jemima’s French bulldog Frida and pillows- climbing to the top, spreading out our tart treats pouring cold rose. This recipe was one we made up specially for evenings like this, a Tart classic here to stay. 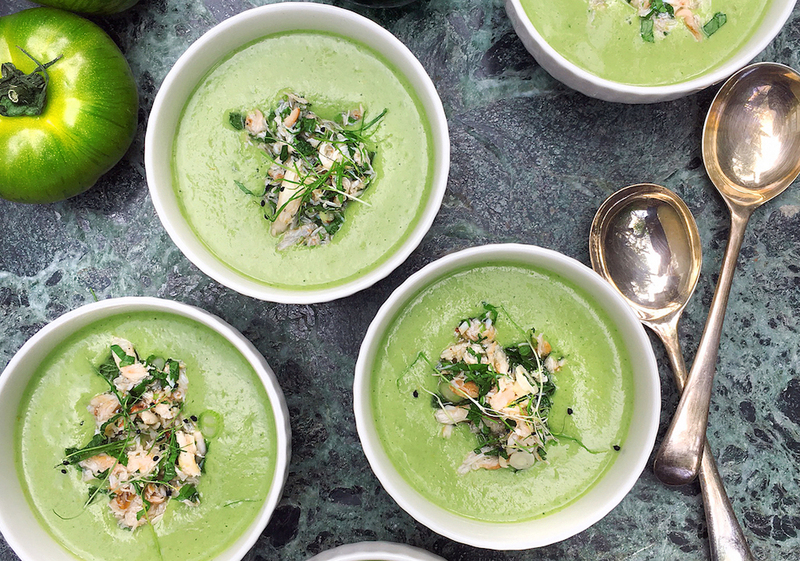 A chilled soup on a balmy summer evening is just what one feels like, impressive to serve for your friends (specially when avocado green), delicious and light and so incredibly easy to make … but of course for the majority of the year a cold soup in England sounds quite hellish (us brits opt for warming broths in this grey drizzling climate). So the moment we find ourselves sitting outside enjoying whatever outdoor space we have we eat like they do in the Mediterranean, simple and fresh. This soup is our take on the classic chilled dish- full of ripe summery flavor, velvety smooth and punchy in colour , make sure to have ice cubes to serve. We couldn’t think of anything better for this time of year- avocado being packed full of numerous nutritional benefits, very high in potassium and magic super oils for your skin and hair, is ideal for spicing up, and this soup really packs a punch but at the same time feels soothing and refreshing with the coconut milk and lime. Crab is an added decadent treat which really brings it all together, but would also be good with a crunchy salsa of finely diced cucumber red onion, coriander, mint and tomatoes. For the soup just simply add all your ingredients into a blender/magi mix and blitz until smooth- important to taste to your liking. Could need a little more lime for zing or salt or maybe even more chilli (we personally add more). In a bowl mix all your crab ingredients together Once the soup is chilled, serve with a dollop of your crab mixture and any other added garnishes- (micro)herbs, radish, chili etc.